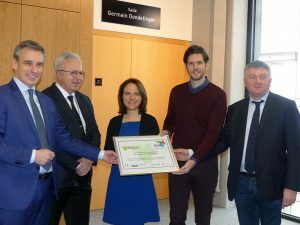 A consortium of researchers from Université de Lorraine, Universitat des Saarland and Technical Universitat Kaiserslautern received the Interregional Research Prize 2018 of the Greater Region for their international Magnetism Network. This award was presented on january 15th, 2019 by the Minister of Higher Education and Research, and the Minister of the Greater Region of Luxembourg, on the occasion of the 5th Interministerial Conference of Higher Education and Research of the Greater Region on the Belval campus of the University of Luxembourg. The Greater Region is an European region covering Lorraine in the French region Grand Est, Wallonia, the Federation Wallonia-Brussels and Ostbelgien in Belgium, Saarland and Rhineland-Palatinate in Germany as well as the Grand Duchy of Luxembourg. The prize aims to distinguish scientific teams from the Greater Region who make use of the cross-border context in their research projects. The collaboration in the fields of magnetism and magnetometry between the universities of Saarland, Kaiserslautern and Lorraine, which has gradually spread to the Université du Luxembourg and the Université de Liege, has been initiated in 2012. Through the organization of regular meetings between researchers and engineers from the Greater Region, through the mobility of scientists, doctoral students and students, as well as exchange of knowledge and tools, the network carried out high impact fundamental and applied research activities, popularized magnetism in the general public especially through exhibitions, promote R&D collaborations with industrial partners. – In the field of doctoral training: the 2020 European School on Magnetism, part of the Series of the European School on Magnetism ( http://magnetism.eu/135-2020-school.htm), will take place from Sep 28th to Oct 9th 2020 in Saarbrücken, Germany. The School is chaired by Leon Abelmann, in association with the magnetism communities in Kaiserslautern (Germany) and Nancy (France). The topic is “Magnetism and Societal Challenges”. – In the field of research and technology transfer: co-financing of an engineer dedicated to the development of the European Magnetometry Network (www.magnetometry.eu). Based on previous successful networks in the Greater Region and in France, the European Magnetometry Network aims to build a mixed public-private community in the field of magnetometry to intensify scientific and technical exchanges, as well as to favour the accessibility of magnetometry platforms.